Oh how I love this boy! His personality is really starting to shine through now. He's coming into his own, and really starting to show us who he is. He & Liam are so similar, that at times, Finn just feels like baby Liam all over again. The more I learn about him, the more I fall in love! I treasure my alone time with Finn and learning about the unique boy that he is becoming. I think he has a bit of my (and Liam's) stubbornness. He loves to laugh (but saves the biggest, deepest laughs for Liam). Stranger danger is starting to set in, and he wants eyes on Mama at all times. He loves being snuggled up in my sling. Whenever I go to put it on, he kicks his legs in such excitement & anticipation. He is showing much more emotion and can barely keep still. Also, the back arching has begun which is just no fun for anyone. But the biggest biggest news is that he officially says "Mama"!!!! I know this early, but I promise you he says it. I was skeptical at first (since he also says the "baba"sound), but he definitely says Mama to me, particularly when he is upset. I've heard second babies say it much sooner since they hear their older sibling saying it all day. It's just the sweetest sound and warms my heart every time I hear it! Stats: Height: 27.76 in (almost the exact same as Liam) 90%. Weight: 20.72 lbs (3 lbs bigger than Liam) 93%. He's still a big guy. Not much fat on him; he's just dense! Eating: BLW is going well! He's not ingesting much as expected (except for a bit of butternut squash soup that he was particularly into), but loves gnawing on and trying different foods. His most favorite is pork. He will gnaw on a piece for an entire dinner time. I think he loves the taste, but also how it feels on his gums. Nursing is also still going well. We've hit that distract-able (think I made that up) age, so sometimes he has a difficult time staying latched on when there is lots of excitement around. He doesn't nurse for comfort nearly as much as Liam did, but I think that may be in part to my oversupply. Sleeping: My unicorn sleeper is gone, and now I have just your typical breastfed baby. He wakes every few hours, but every so often gives us a good 5 or 6 hour stretch. Conor is able to rock him back to sleep half the time, and the other half he actually wants to nurse. We are cosleeping, so we quickly get him back down and fall back asleep ourselves. I'm so happy to have a different perspective this time around. I am perfectly okay with Finn's sleeping habits. I know they are normal and to be expected. While I may still be exhausted some mornings, I know that I am meeting all of Finn's needs and that makes all the sleeplessness worth it! Likes: Finn likes most things. He's a very go with the flow baby. If he has big brother's attention, then he is perfectly happy. I can spend hours watching Finn watch Liam. It it simply the sweetest! He is still a lover of the outdoors, bath time, & being tossed in the air. He's very ticklish, especially at his arm pits and upper thighs. Such a happy little baby! Nicknames: Finnier, Finnaroo, Finner, & Huck (I'm still trying to make this one happen). Finn is becoming more & more aware of the world around. I love experiencing all these firsts all over again with him. His innocence and his happiness are remarkable. I cannot believe that half a year is already behind us, but life just keeps getting sweeter & sweeter with my chubby cheeked boy! cutest baby ever :) he's just so big. Only 6 months old and probably not too far off of Sophie's weight (she hasn't been weighed since July at 23lbs). So cute that he says mama already :) Its going to be so great to see their relationship when they're older. Seriously what a cutie! I love that his personality is starting to shine through and that he has similarities to Liam but is very much his own person. Those cheeks!!! Just love him, Laura! What a sweetie!! Happy half birthday, Finn! That last pic!! :) His fuzzy head is too adorable. Oh my word. Precious. Just precious! 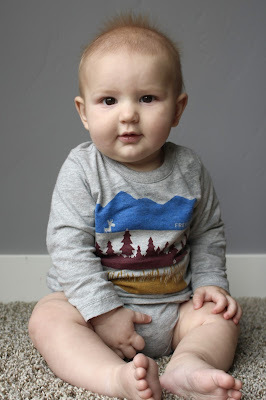 Happy 6 months, Finn. hahaha love that you are trying to make Huck happen. he seriously just looks so happy and those cheeks. I want to squeeze. I can't get over that fuzzy hair and those big gorgeous eyes! He is just adorable! And I can't believe he's saying mama! Both my kids were saying Dada really early, so I'm totally jealous! Such a handsome boy! Happy 6 months, Finn! :) I am so jealous of your oversupply, Mama. I have always been the opposite, and my breasts have just dried right up this time. So sad. You can't look at him and not smile!! He is just so precious!! So tell me more about your sleep situation. We cosleep too but I nurse Ben back to sleep each time. He basically uses me as a pacifier (not actual nursing, just suckling) all night long. Literally, if my breast pops out then he wakes up. Do you experience this? Have you been able to avoid this? Is that why you also rock back to sleep in the middle of the night? I don't mind the all night nursing because he doesn't nurse much throughout the day due to being distracted. Just wondering if there is a way to simply nurse while cosleeping and not necessarily be a pacifier too. Side laying is rough on my pelvis. ha! I totally believe that he's saying mama! And I love how great of a job he's doing sitting up! Precious. Happy half birthday! Noah weighed around the same at that age too! And I'd describe him the exact same way, not fat but dense! He's the same even now! His swim teacher said he's not a natural floater ;). Anyway, Finn is adorable and love that his personality is really shining through! Ahhh that sweet little face! 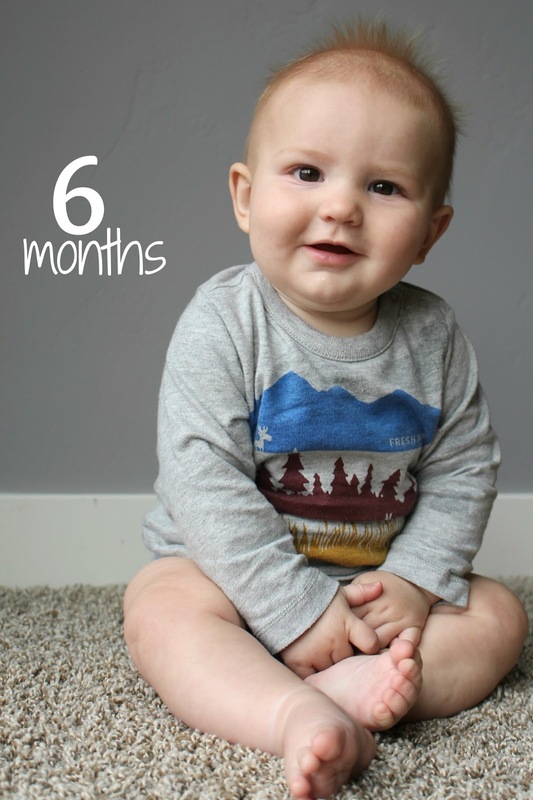 Happy 6 Months to your little man! Oh my gosh, he's such a little (well, big!) love! 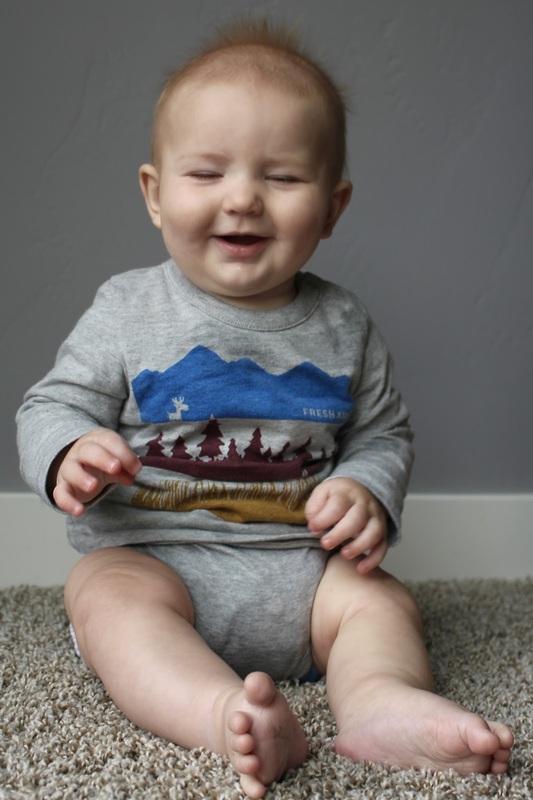 I just want to squeeze those cheeks!